Different: Each product in a system is operated by only its own individual key. Alike: Multiple products in a system is operated by one key. 3-in-1: Solution, allowing users to conveniently change the combination two times without replacing the cylinder. Extra keys per product. Please note: sets are considered as one product. Add-on item: Replaces bolt faceplate for easy installation on a metal door. No mortise required. Add-on item: Required for thick doors (2" to 3 1/4"). Includes long screws and cylinder tails. Add-on item: 3/16" thick. Required for thin doors (1 5/16" to 1 1/2"). Provide additional information or leave comments if necessary. Interior finish: Satin nickel (619, US15). Backset: Adjustable (2 3/8", 2 3/4"). Function: Classroom (Inside thumb turn enables unlocking only, while external key can both lock and unlock). 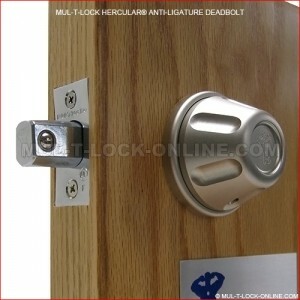 Mul-T-Lock’s Anti-Ligature Hercular® Deadbolt meets the unique locking needs found in institutions such as hospitals and health care facilities where its rounded shapes and lack of angles greatly decrease an occupant’s risk of injury or self harm by incidents such as hanging, pulling off of lock or making contact with edges. Anti-ligature fixtures in hospitals also serve as an easier-to-operate hardware alternative for individuals with hand/wrist injuries or a weakened grip as they are generally easier to operate than a more complex lock or handle and as their smooth design lends less opportunity for accidental injury (such as snagging a bandage). The anti-ligature Hercular® deadbolt is offered in a function that allows for unlocking from the inside by use of the thumb turn at all times, while preventing locking from the inside. This feature ensures that quick and easy unlocking of the door from the inside is always accessible to the occupant, while attempts to lock the bolt from the inside using the thumb turn will not succeed, resulting instead in the thumb turn freely spinning without engaging the bolt. From the outside however, both locking and unlocking via a key is always possible. Please contact us to get RMA. All returned products must be in original condition and shipped out within 3 business days after getting RMA. © 2005-2019 Frankson Hardware, Inc., an authorized dealer of MUL-T-LOCK USA. All Rights Reserved. MUL-T-LOCK® is registered trademark of Mul-T-Lock Ltd. While we try to be accurate we cannot be held responsible for descriptions, inventory levels, or mis-prints.